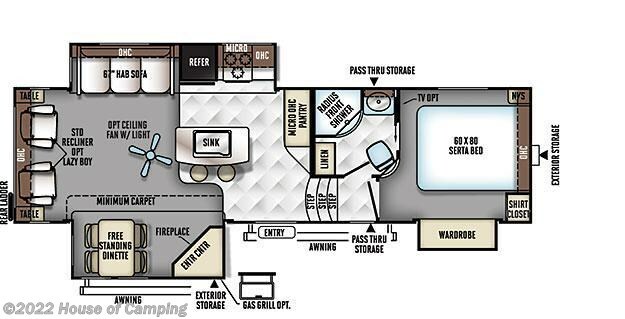 REESE REVOLUTION PIN BOX HITCH, HIGH GLOSS TPO FRONT CAP, HIGH GLOSS GEL COAT EXTERIOR, ALUMINUM SOFA AND DINETTE BASE, REAL WOOD DECKING,ALUMINUM CAGE CONSTRUCTION INCLUDING ROOF AND WALLS, VACUUM LAMINATED 1 PIECE ROOF AND WALLS, ENCLOSED UNDER BELLY, THERMOSTATICALLY CONTROLLED HEATED HOLDING TANKS, POWER LANDING LEGS, DEXTER TORFLEX AXLE, A&E POWER AWNING WITH LED LIGHT STRIP, POLISHED ALLOY WHEELS, NITRO FILLED RADIAL TIRES, LED TV WITH MULTI DIRECTIONAL ANTENNA, MULTI ZONE STEREO WITH DVD/CD/AM/FM STEREO AND BLUE TOOTH CONTROL, OUTSIDE STEREO SPEAKERS, TOUCH BUTTON/BLUE TOOTH CONTROL PANEL, SLAM LATCH BAGGAGE DOORS AND MAGNETIC DOOR HOLDERS, 13,500 BTU DUCTED ROOF AIR, SOLID SURFACE KITCHEN COUNTER TOPS WITH TILE BACK SPLASH, UNDER MOUNT STAINLESS STEEL KITCHEN SINK W/HI RISE FAUCET, RECESSED COOK TOP AND OVEN WITH FLUSH MOUNT COVER, HIDDEN HINGE CABINET DOORS, SELF CLOSING ROLLER BEARING DRAWERS, MICROWAVE OVEN, EXTRA LARGE DOUBLE DOOR 2 WAY REFRIGERATOR, SERTA INNERSPRING MATTRESS, QUICK RECOVERY AUTO IGNITION GAS/ELECTRIC WATER HEATER, BLACK TANK RINSE, SPARE TIRE CARRIER AND COVER, REAR LADDER, BONDED WINDOWS, PREWIRED FOR BACK UP CAMERA AND SOLAR PANEL. 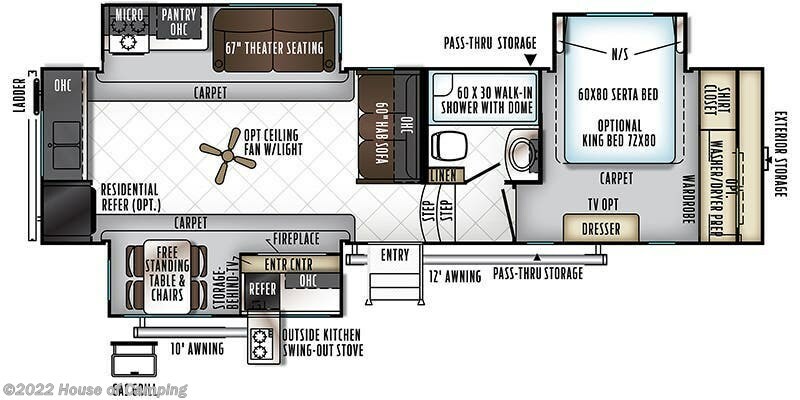 CHAMPAGNE EXTERIOR WITH COLORED KEYED ROOF, 4.0 LEVELING SYSTEM CEILING FAN, RAISED REFRIGERATOR DOOR PANELS, 15,000 BTU DUCTED ROOF AIR UPGRADE, SLIDE TOPPER AWNINGS, LED BEDROOM TV, OUTSIDE GRILL, CO DETECTOR, WATER FILTER SYSTEM, MAX AIR VENT FAN WITH VENT COVER, FREIGHT, PREP AND DOC FEES. 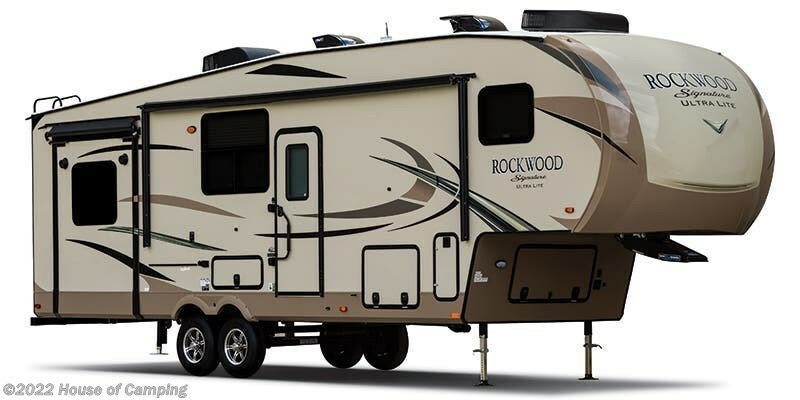 See this Stock # R202045265 - 2020 Forest River Rockwood Signature Ultra Lite 8290BS on House of Camping! Check out Stock # R202045265 - 2020 Forest River Rockwood Signature Ultra Lite 8290BS on forestriverrvsource.com!